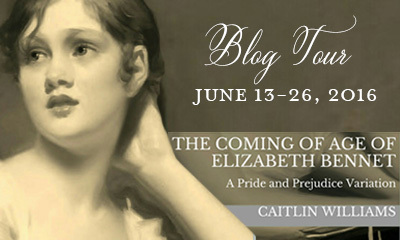 Today I am very pleased to post a review as part of the blog tour of The Coming of Age of Elizabeth Bennet by Caitlin Williams. This is the second novel released by this author, and one that I have been eagerly waiting for. I read Caitlin Williams’ first novel, Ardently, shortly after it was released and fell in love with it. One year after its release date, Ardently is still one of my favorite books, and I dare say on my Top 5 best JAFF books. Ardently caused such an impression in me that I remember staying up all night reading it and writing its review. I just could not let go of the story and the characters, so you can imagine how happy I was to learn that Caitlin Williams was releasing another novel. This second book is The Coming of Age of Elizabeth Bennet and it takes a completely different direction than Ardently. If you read the blurb you’ll understand why. 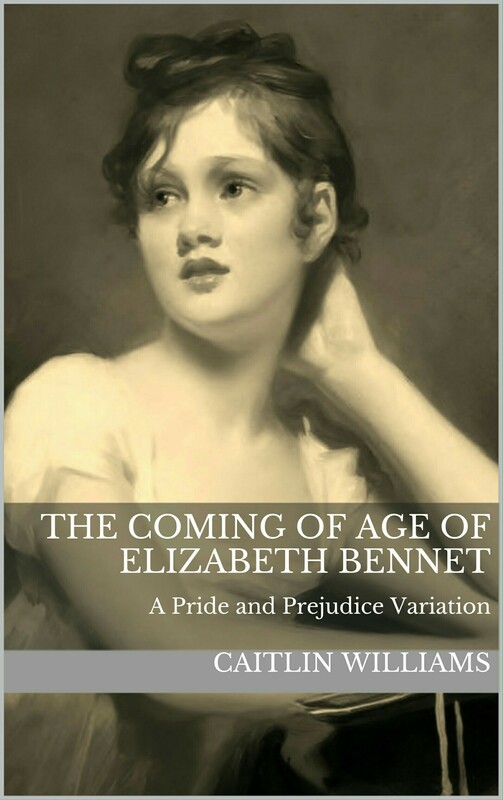 The Coming of Age of Elizabeth Bennet is organized in 4 volumes, each volume centered on one year of Elizabeth’s life. The first volume starts with a grieving 15 year old Elizabeth suffering the loss of her dear father and having a hard time accepting she will be sent to Derbyshire to live with people she has never met, leaving all her family and friends behind. This becomes too much for her to bear, and she decides to run away precisely on the day Mr. Darcy and his father are supposed to take her away with them. Young Mr. Darcy offers to find and bring her back home safely, but the search will not be what he is expecting, and circumstances dictate that 23 year old Fitzwilliam Darcy marries 15 year old Elizabeth Bennet to save both their reputations. Elizabeth is obviously not pleased with the outcome of her foolish behavior, and the first chapter of the book will show us a “Lydia like” Elizabeth adapting to her new life and family. I confess the first volume was quite hard for me to accept because Elizabeth was, in my opinion, too immature and insensible, and Mr. Darcy too spoiled, cold and proud. But as I continued reading the book, I’ve come to understand that it was necessary for me to see these characters as such, because only by seeing how they were at this age, I would be able to enjoy the following chapters, which will show us, through an incredible understanding of human nature, how these characters will grow to become the perfect match. On P&P we meet a witty mature Elizabeth at 20 and a proud and honorable Darcy at 28, but they were not always like this, and Caitlin Williams takes us into a journey that will show us how, despite the changes in their lives, they will grow to become the characters we dearly love. I must say the outcome is one of the most faithful descriptions of these characters I have ever seen. By the end of the book both Darcy and Elizabeth’s characters are true to the concept Austen created. As Elizabeth and Mr. Darcy were growing into the characters we know, so was I growing fonder and fonder of this book. It gave me particular pleasure to see Mr. Darcy become the man I know him to be. Even though this book is told from Elizabeth’s perspective, and Mr. Darcy’s is not present during great part of the book (much as in Pride and Prejudice), it was his character development that I loved the most. I liked seeing how his relationship with Wickham was before Mr. Darcy realized what a bad influence he was for him. And I liked seeing a Mr. Darcy who was not yet stern, hurt and full of responsibilities due to his parents death. I had never seen a book describe so well Mr. Darcy’s growth from a young man without major responsibilities into a responsible brother and landlord. The book continues describing Elizabeth’s daily life and the battles she has to overcome to become the witty, cheerful girl we know her to be, and in volume 3 when she decides to go downstairs to dismiss her maid from her duties, I knew that Elizabeth had become the person we know so well. She realized she had to change and earn her place, and so she did. By volume 4 I was already completely and utterly in love with this book. This last part of the book gave me some of the most romantic scenes I have ever read on a JAFF book. Elizabeth and Darcy’s first kiss was just absolutely perfect and no words can describe the feelings it brought me. In fact, all scenes that occurred on Elizabeth’s 21st birthday were incredibly well written, full of powerful, well designed scenes such as the offering of her birthday present, the first kiss and Wickham’s appearance. Summing up, The Coming of Age of Elizabeth Bennet is certainly a very different book that caused so much controversy feelings in me I will hardly forget it. It is an intense, wonderful life story that will show us how people can grow and learn to be better. It describes a love story as I have not seen described in JAFF before, Darcy and Elizabeth’s relationship evolves slowly, it is built over the years and they learn to know, respect and love one another. Their biggest obstacles appear at a stage where they are both sensible enough to talk and trust one another, so I guess Caitlin Williams took pity of our poor nerves and had Elizabeth hear Miss Bingley’s comments and Darcy hear Wickham’s tale when they could no longer arm the feelings that were carved in their hearts. I can only hope Mrs. Williams will give us further pleasure and write this story from Darcy’s POV. He was my favorite character in this book (even though Col. Fitzwilliam was really close to perfection by being the voice of reason to both Darcy and Elizabeth), and I would dearly love to see his point of view and to know what happen during the periods he was away. May I dare hope? Excited about this book? The blog tour is just starting, don’t miss the other reviews, excerpts, interviews etc. 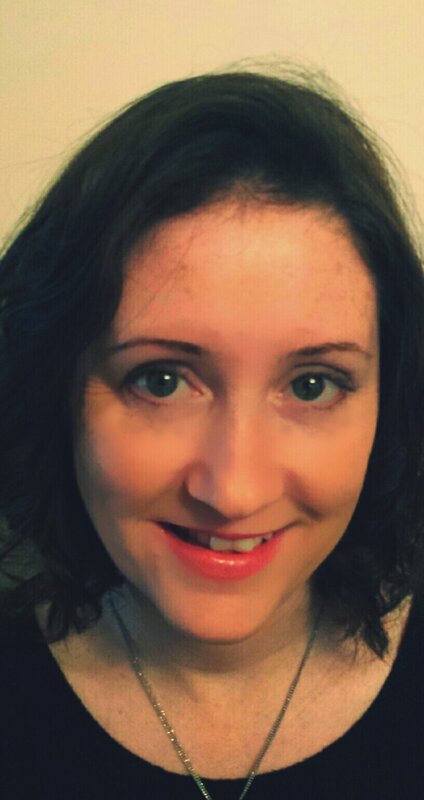 To celebrate the release of her second novel Caitlin Williams is offering 8 ebook copies of The Coming of Age of Elizabeth Bennet. All you have to do is comment on a blog tour post and click on this link to guarantee your entrie. Great review! I will be starting this one tonight, and I can’t wait! I really need to read Ardently, too! Knowing that this is a variation and furthermore, not having these early years in ODC’s life written by Jane Austen I had no problem accepting that Elizabeth rebelled against her father’s dictates. After all she was first of all her father’s favorite and secondly she was the one being sent far away to strangers. She was being sent to a place where she might have little if no hope of seeing the rest of her family for a long time. Jane gets to go to the Gardiners and her foolish younger sisters, even “saint” Mary, get to stay in Meryton with their mother. So from my stand point Caitlin wrote a very believable story of Elizabeth’s angst with her father’s death and her “fate”. This was more than a 5 star story for me. Loved it. Read it twice already. I took a hard time accepting it Sheila, but as I kept reading I understood that was the tone and purpose of the book. We are not suppose to find the 21 year old Elizabeth at the age of 15. She needs to grow and learn how to be the person we expect her to be. Caitlin Williams did a wonderful job in showing us how people can change through time, how they can grow and improve themselves. She did it not only for Elizabeth’s character but also for Darcy’s, and I loved that. This book has such a cool premise! I’m really excited about reading it to find out how everything turns out. I have read some reviews on Goodreads, and I am happy to say many have liked the book. I am now looking forward to it! I can’t wait to read it! Thank you for your thoughtful review Rita! You captured the essence of what so many other readers are loving about this story. It’s really inspiring how the JAFF community has responded to this story. I’m thrilled you loved it too. For me, I also loved seeing Elizabeth at 15, since we know a lot about Lydia and Georgiana at 15, which was such a pivotal age for them, so it’s a neat way to connect this story with Austen’s story, isn’t it? I can’t tell you how much I appreciate your time and support of this story and book tour. Thank you, Rita! Thank you Claudine! It was really exciting for me to be part of the blog tour and a true joy to see how the book is being so well received amongst readers! Hi Glynis, yes, this one is very early, but don’t worry, Darcy would never rush things with a 15 year old, and (a bit of a spoiler, but probably you’ve seen this already) he will leave her to take care of some business and will return when she is already older and mature. That is not when their relationship beggings, because I would say that their relationship was a roller coaster since the beggining, but that is when the real romance begins 🙂 And what a romance!! This sounds wonderful, can’t wait to read this! Thanks Rita, for being part of the tour and for your very thoughtful review. As you quite rightly say, it’s a book about changing and growing, and none of us are the same at fifteen, as we are at 18, or 20 and we do things when we are young that we look back in horror at. The Elizabeth in this story is going through the angry stage of grief and not yet mature enough to know how to deal with her emotions. She’s an intelligent and sensitive girl, so questions things rather than just going along with what she is told to do. With all that happens to her it takes her a long time to ‘grow up’. I hope some of that came across.I think when we read and write we can’t help but project ourselves onto the characters we encounter, and I know that I was once very foolish and selfish, but I hope with each passing year I grow in my understanding of the world and become more accepting of it. Anyway, now I am rambling, LOL. But I really appreciate your review. Thank you Caitlin! It is a very insightful book when it comes to human nature and I think all of us will identify ourselves at some point with some of the characters, not just Elizabeth, hit all of them. I loved when young Jane dealt with Elizabeth in such a mature and reproachful way, or Col. Fitzwilliam’s “father like” figure through out the entire book, Miss Temple’s dedication and resilience or the Countess of Matlock’s prejudice. Their were a perfect portrait of human nature with it’s qualities and faults. None of us are perfect and neither were these characters, which made them even more real and loving. I’m part way through Volume 1 and I can easily imagine Elizabeth Bennet and Mr. Darcy being these people in their younger years. Life’s lessons will change them into the characters we see in P&P, even though they have much more to learn in that novel. I was surprised, though, as I didn’t realize this was an FMS novel! Love it when they have to grow and change together, and fall in love as a result (I assume!). Yet this is a huge leap in comparison with Austen’s time line, as both are so immature right now! Wonderfully imagined, Caitlin. Thanks for the review, Rita! I finished reading this novel by ignoring my responsibility to writing a new scene for my story that’s being edited. That’s how much I was into the novel. Masterful, masterful story telling. I was totally immersed, and every twist was true to the development Caitlin so carefully set up for us. Some aspects, such as the huge time line, had to be difficult to manage, yet the transitions were smooth and the novel flowed and led the reader forward at every moment. Excellent forward and backward progress caused some angsty setbacks for ODC as their stubbornness and lack of communication reminded them of their past disappointments. Well done! The JAFF world is going to have a hard time surpassing this for a long time. Ugh. I sound like such a sappy fangirl, but it’s true! I have read several exceptional novels in the last few months (including Ardently! ), and The Coming of Age of Elizabeth Bennet leaves them in its dust. Now, that is good to know that they start out quite raw and immature and grow to be the people we recognize in Austen’s story. Intuitive and insightful storytelling, but I appreciate you giving me a head’s up, Rita, so I’m in the right mindset when I start the book. I was a bit caught by surprise. Sometimes it happens to me in the beggining of a book, something is so different that I’m still trying to adjust. Usually I end up loving them! It happened with Suddenly Mrs. Darcy and I loved it as well!! I really like coming of age stories, the feeling of growing and becoming that comes with it! Can hardly wait for a chance to get my hands on a copy and devour it, as I am sure I will – and this review from rita only confirms it! I know that you would love is one Sónia! It’s clearly the type of book you will devour in one day despite its length. And it is so far away from canon that it’s interesting to read. Good luck in the giveaway! Obviously I, and every other P&P fan, will need to read this book. (And I’d be delighted to win a copy!) Reading P&P (the original) does leave one wondering how each character got to the place they are at when the story commences, and I also encourage the author to explore events from Darcy’s perspective in her next book. Many thanks for this wonderful review and for the generous giveaway offer. You are mistaken, Rita. It is not possible to be “too obsessed” with Mr Darcy! I’ve been following this book tour and honestly can’t wait to read this book! thanks for the review and giveaway. Lovely review, Rita! I would love love LOVE the ‘Coming of Age’ from Darcy’s POV! I was enthralled with this story, I just wished it would never end. Such a journey and what a transformation for both of them. And indeed, thank goodness for Colonel Fitzwilliam, he truly was their voice of reason. Congrats on a wonderful book, Caitlin, and looking froward to more. Great review,Rita. Have this book on my TBR list and when I’m finished the book I’m currently reading them I’m going to delve into this. I loved Caitlin’s Ardently and Even more ardently,so I’m sure to love this too. You are kiling my TBR-on-holidays budget Rita! Excited to start reading it. All I keep hearing, is people wanting a Darcy POV, I already know, that by the time I finish reading, I’m going to be saying the same thing lol! Oh I absolutely loved this book. Who at 15 makes rational decisions or allows for another point of view during difficult times…no one understands what I am going through? This was such a well developed story that just tore at my heart. Carole, wasn’t it brilliant to connect Elizabeth at 15 since Lydia and Georgiana make such poor decisions at 15? I loved seeing her at 15 and watching her character evolve in this manner. Thanks for your comments! “Oh that is terrible. Fifteen is quite terrible…Who knows what to think or feel, or who we are supposed to be at fifteen?…” (Constance Balcombe) :))) That is probably the attitude with which we all should approach story about fifteen years old Elizabeth. Current me is sure that 20 years old me was a silly creature and fifteen years old me – oh that was terrible! Thank you for lovely and insightful review which lifted a little for me the curtain over the book plot and greatly intensified my wish to read the Coming of Age of Elizabeth Bennet. Definitely a different sounding variation here. So many people above, whose opinions mean a lot, including yours Rita, say this is a really good read, so it’s going on my Wish List right now! It also very much sounds like a companion volume from Darcy’s POV simply has to be written! I haven’t read Ardently yet either, and due to my inability to sit for more than short periods, my TBR list is growing at an exponential rate! Great review and I loved the character development especially Darcy too!! I kept reading some of my favorite senses and this is really a unique variation. And I had purchased “Ardently” just after reading “The Becoming Age of Elizabeth Bennet”. But I haven’t start reading it as I am afraid I cannot put it down so I must wait for a longer holiday. I hope anyone who wins the book can enjoy and love the book. Good luck to all!! I love character development of both Darcy & Elizabeth in this book too! I really like how Elizabeth earns the respect of Mrs. Reynolds and the staff too!